Easily merge multiple mp3 audio files together in few clicks! Looking for a program that can help you merge multiple audio files into one? You’ve landed in the right place! There are many audio players that claim to support it, but nothing beats joining the files in question into one large MP3 file that will surely not have any gaps between the tracks! Now you can listen to your favorite album, fully gap-less, on your favorite media player. Or you can join your favorite audio book into one, forever eliminating the problem of hunting for the next chapter. Here you can download Merge MP3 – a multi-functional yet easy-to-use software program that can help you with a wide range of different audio formats and combining several audio files into one. Tired of looking for small and easy-to-use software for merging your audio files without quality loss? Puzzled by a way to send an audio greeting to your friends, relatives and all who are dear to you? Look no further – Merge MP3 is just the piece of software you have been looking for! No confusing menus, no tricky timelines, no fancy technical terms – just drag’n'drop your favorite compositions from Windows Explorer into the program window or add them through the program dialog, arrange them in the desired order and press the “Merge” button. The resulting file will be ready in a wink of an eye! Boasting a multi-language interface, an intuitive interface and an ID3v1 and ID3v2 tag editor, the program is perfectly functional and does its job very well – all that at a very affordable price! The program supports both MP3, WMA and WAV files over 2 GB in size and lets you listen to your audio files from within the application using the built-in player. Discover a musician in yourself! Perhaps you have tons of MP3 or any other audio files in formats like WAV, FLAC, M4A, AAC, M4B, AC3 and you are trying to combine them into a big one so that you can enjoy the files orderly and without interrupts or upload the complete one to your websites to share it with your family, friends or even people around the world. If so, you need a professional Audio Joiner to finish this task. 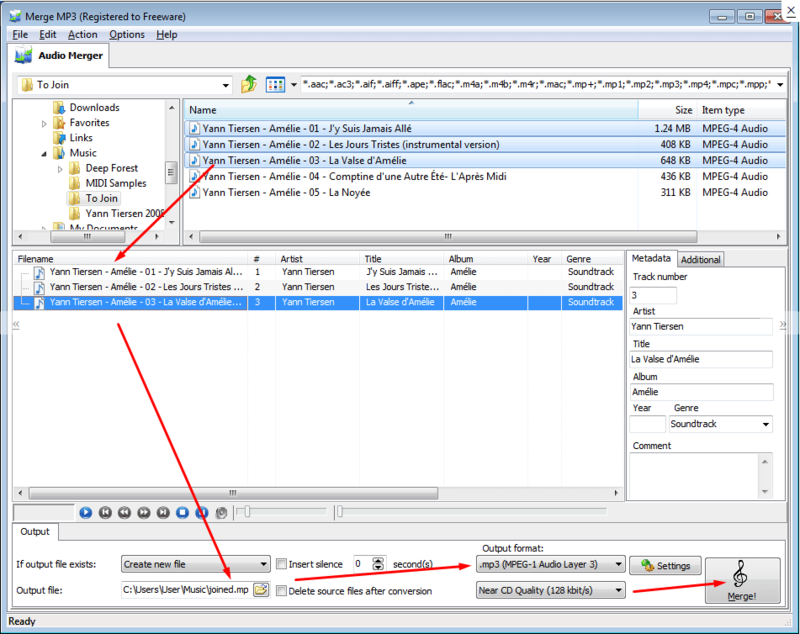 Merge MP3 helps you merge multiple files or parts of multiple files into one bigger file. This MP3 Merger has the ability to merge with fast speed without re-compression or quality loss and ability to handle large size data. It converts files among MP3, WAV, WMA and OGG as audio converter and provides convenient presets and parameters adjustment for you to customize the detailed parameters for each format. You can drag-and-drop simplicity to move or add files easily and join directly without costing any other disk space. By the simple interface, you can easily add or delete files to be merged& converted. On-the-fly merging, no temporary file generated. It also supports batch MP3 merger or converter process and will save your precious time. Very ease to use! To satisfy the needs of customers, here, we mainly introduce an efficient and reliable MP3 Merger for you. This MP3 Merger is pretty simple to use and what you need to do is just three steps so that people who have no specialized knowledge can handle it effortlessly. This MP3 Merger is also perfect for professionals because it has advanced settings which can fulfill the requirement of optimizing MP3 files. It can join MP3 files without re-encoding, or join MP3 clips as well as convert MP3 to other audio formats like WAV, AAC, M4A, AC3, WMA, MP4, AIFF, FLAC, etc. This MP3 Merger is the simplest and easiest to use mp3 joiner and song merger you can find. You can merge multiple mp3 files into one continuous mp3 file. Mp3 merger concatenates and combines mp3 audio files from end to end to play sequentially. Mp3 merger reads two mp3 files as input and combines them quickly without losing the audio quality of the files. You may use mp3 merger to put all your favorite mp3 audio as a single file. This may be useful in creating a playlist for media players that don’t support sequential play of files. You may use mp3 merger to combine small mp3 files into one file for storage convenience. There are many reasons to use mp3 merger and it’s all up to you. You can choose the output format between multiple options. With Merge MP3 you can easily merge mp3’s into a single mp3, aac, ape, flac, m4a, m4b, mp4, ogg, wav or wma file. In fact, your source files don’t even have to be MP3’s – with software to merge mp3 files you can join aac, ape, flac, m4a, m4b, mp4, ogg, wav and wma files together just as easily! This MP3 Merger is suitable for creating long audio mixes, for uninterrupted play time, instead of composing a playlist, for instance. You may also set quality options, output file size, audio channels and bit rate. The software allows you to choose between a constant or a variable bit rate and set the minimum, maximum and average values, from 32 up to 320 KB per second. Merge MP3 can even seamlessly merge files between lossy and lossless formats. For example, you can merge a bunch of FLAC and MP3 files into a single compressed mp3, aac, or ogg file, and vice versa. Some CDs like medleys and remixes have no pauses between the tracks, featuring continuous, uninterrupted playback. You can do this, too! When using Merge MP3 to combine mp3 files, you can opt for gapless playback by specifying zero-length pauses. Mp3 Merger can be used for a wide range of purposes. You can merge two mp3 files together in a number of formats. You can merge short mp3 files captured by a voice recorder. If you used the recorder to record lectures, you can merge mp3 files into one file to cover the entire recording out of the many different fragments. Finally, you may just want to reduce file clutter and merge audio tracks in a variety of formats together into a single super-mix. For MP3 Merger, it does not matter if the audio files you’re merging come in a single or different formats. Merge MP3 can join mp3 files in a variety of audio formats, encoded with different codecs using different settings. It is easy to join files you downloaded together even if all of them come in different formats. Supports freely playing the following audio formats like Vorbis, AAC, AC3, ALAC, OGG, OGA, MP3, WAV, FLAC, WMA, M4A, M4B, APE, AIFF, MPC, SPX, etc. Join audio files perfectly! This MP3 Merger has the ability to join, merge or combine audio files with the same or different formats to MP3, MP4, WMA, WAV, FLAC, AAC, M4A, OGG, AAC, AC3, AIFF, APE, CUE, MP+, MP1, MP2, MPC, MPP, OFR, 3GP, 3G2, OFS, SPX, TTA, WAV, WMA, WV, ALAC as source formats. Any separated audio files can be joined to the most popular audio formats as MP3, OGG, WMA, WAV, etc. MP3 is a common audio format for consumer audio streaming or storage, as well as a de facto standard of digital audio compression for the transfer and playback of music on most digital audio players. MP3 is a very popular music format which can be played on multiple multimedia devices, such as portable music players, DVD players, smartphones etc. Every day, numerous people spare no effort to seek a powerful MP3 Joiner in order to join tons of MP3 clips into one for storage or playback or join songs together online or merge two mp3 files online. Merging audio tracks together is now being popular due to the good things that it brings to all music enthusiasts. Unlike the traditional single track play which creates a fade away affect after each song, the merged mp3 files can be played continuously even after each song without any interruption. This benefits particularly those that love to play a long music list for hours. Now you don’t need to upload your mp3 files to join songs together online or merge two mp3 files online, all you need – just download merge mp3 online. The other good thing when you merge mp3 files is that transferring it to other portable device and gadgets is now easier and more convenient, compare to transferring individual track that will take some time to accomplish. These are the basic key point that is why many music lovers tend to put all of their mp3 tracks in one audio file. What’s the best way to merge mp3 files together? You can’t merge mp3 files together without the use of a tool, let’s go deep into the various methods that can be utilized in combining multiple mp3 tracks all together. In this article, we will introduce two different ways you can use to merge several songs into one single track with ease (check out our complete guide on how to split MP3 files instead if you want to cut your music file into separate tracks). In the first method that we have we are going to use of a well known audio editor which is Audacity. Load MP3 files into Audacity. To start with its mp3 merger function you need to install it first and launch it. Now on the Audacity’s interface hit File; Open and load all of the mp3 tracks that you want to join together. Combine mp3 files. Next is go to the editor and highlight the part of the song that you want to merge then hit the Edit button followed by Copy. After which move to the succeeding track, on the boards editor move the cursor at the end of the track and press Edit > Paste . Repeat this process until all of the mp3 files that you wish to merge for you project is done. Save the final mp3. The last thing that you need to do is to save the file that you just created. What you must do is to hit File > Export >look for the folder where you want to save the file, choose mp3 file format and click Save . Just wait for few seconds and your new mp3 file is ready. However, many individuals that utilize this audio editor have issues regarding its performance. These concerns include a hard to use user interface that can cause confusion especially for first time users. Since it needs to be installed, issues of lagging and unresponsiveness are also included in this problem. Make Preparation: free download and install this powerful MP3 Merger on your Windows, and then follow the step by step guide to combine audio files within minutes. Here we take merge mp3 as example. Step 1 Add MP3 files you want to merge to this MP3 file merger – simply drag and drop MP3 files to the main interface of the program. Tips: Drag and drop the folder where the MP3 files are to this MP3 Joiner, if you don’t want to add files one by one. Note that these MP3 files are arranged according to the play order. So if you need to exchange the location of two MP3 files, just free drag them to your wanted position. Step 2 Set output format. If you don’t want to re-encoding, just select “.mp3 (MPEG-1 Audio Layer 3)” and “Lossless” as output format. Choose other audio formats as output format if you’d like to change the target format. Step 3 Customize audio parameters: click Setting button to set audio parameters (sample rate, channels, bitrate) for the output format as you want. Step 4 Join MP3 files Simply click big “Merge!” button on the lower right corner of the program to join MP3 files into one in a flash. Now you can play the converted video on iPod, iPhone, Apple TV, Pocket PC, PSP, Zune, Mobile phone, VCD, SVCD, DVD devices. In this article, we show an easy way to join multiple mp3 into one without re-encoding or convert the source MP3 files into other audio formats like WAV, AAC, M4A, etc. It is really worth a shot. How to uninstall Merge MP3? How do I uninstall Merge MP3 in Windows Vista / Windows 7 / Windows 8 / Windows 10? Select “Merge MP3″ and right click, then select Uninstall/Change. How do I uninstall Merge MP3 in Windows XP? How do I uninstall Merge MP3 in Windows 2000? How do I access the Merge MP3 download for PC? It’s easy! Just click the Merge MP3 download button at the page. Clicking this link will start the installer to download Merge MP3 free for Windows. Will this Merge MP3 download work on Windows? Yes! The Merge MP3 download for PC works on most current Windows operating systems. Merge mp3 files online | mp3 merge files | mp3 merge online| download merge mp3 | merge mp3 file | join mp3 online | merge mp3 online free | mergemp3 | mp3 merger | merge music together online | merge mp3 online | join songs together online | merge two mp3 files online | merge mp3 free | mp3 merger software free download | merge songs online free | merge two songs together online free | merge mp3 audacity.